Since Watchdog’s first posting (January 3, 2011, ‘Who Works For Whom’), Watchdog has published 257 postings, including this one. Watchdog has grown from one reader, and one subscriber to our newsletter, to now having readers and subscribers, not only in all 50 states, but going beyond U.S. shores to 88 countries (89 if you include Taiwan). That represents 45.4% of the of the World’s 196 countries, including 12 of the 14 countries still ‘alive’ in the World Cup. Former Naperville residents, along with those elsewhere considering a move to Naperville, comprise a good segment of Watchdog’s readership. Watchdog receives many emails, comments, and questions. Comments, pro and con, are typically posted within 24 hours. Emails and questions are typically answered within 72 hours. Occasionally Watchdog will publish a ‘Q & A’ and this is one of those occasions (Part 7). So here we go. Ans: ‘Spreading the word’, as you refer to, is most important, especially if you can hear it directly from the council members. The video embeds from the meetings do that. Watchdog comments are simply to see things from a different perspective, and movie clips (embeds) add a little flavor for impact. “You go after certain council members (Wehrli, Fieseler and Brodhead), and let others slide (McElroy, Chirico, Pradel and Krause). That seems biased and unfair. Ans: Actually all nine council members have been ‘called out’ at one time or another. It just happens that the three you mentioned along with the three that departed, provided much more material, to choose from during council meetings. When Wehrli is condescending to speakers, Fieseler is disrespectful to residents, and Brodhead is an ’empty chair’, that’s much more interesting to note or show, than McElroy using common sense, Chirico using good business sense, Pradel being reasonable, and Krause getting steamed and outvoted. Watchdog has given credit, when credit is due, even to Wehrli, Fieseler, and Brodhead. Ans: Of course the Naperville city council could do better than Krieger, but for whatever reason they keep him around. There are a variety of possible reasons why Naperville has not taken action for improvement, and unfortunately none of the reasons are good. For now, until the next election, it looks like Naperville is stuck with Krieger, like gum on your shoe on a hot August afternoon. Ans: Overall the council has improved during the last three years. The departure of three and addition of three has been a plus. However more than half of the remaining council members need to ‘turn’ before there is a majority working in the right direction. Naperville is successful because of its people, not the local government. Since 1831, a lot of dedicated people set a course for Naperville that has allowed us to be what we are today. Over the past 5 years Naperville has slipped in its image. It’s still a good place to be, but if better is possible, then ‘good’ is not enough. Better is definitely possible. Watchdog welcomes your questions and comments. Thank you. Who Is The Snobbiest Snob Of Them All? 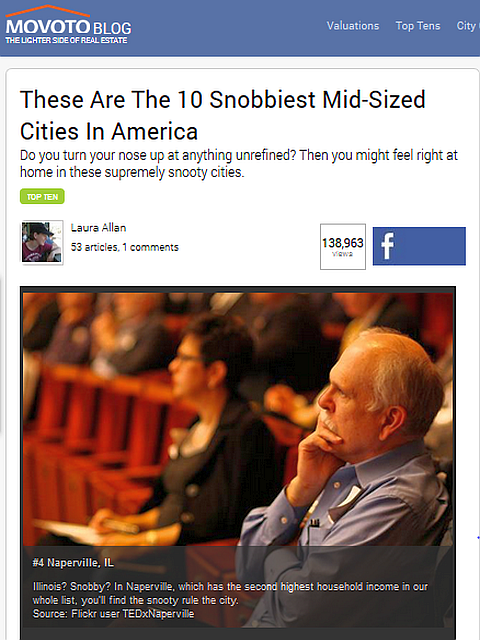 Well, Naperville made it onto another Top-Ten list; this time for being the fourth snobbiest mid-size city in America. This is another ‘accomplishment’ you will not find on the city’s website. The Chicago Tribune, Chicago Sun-Times and CBS-TV in Chicago reported the findings from the blog of real estate company Movoto, which ranked Naperville behind #1 Pasadena, California, #2 Thousand Oaks, California, and #3 Alexandria, Va.
And who rules the city? The Naperville city council and city manager Doug Krieger. So you could say that city officials set the snobby direction for city, and you wouldn’t be wrong. If we drill down a little deeper to find the poster boy on the city council for setting the benchmark for snobbery, councilman Grant Wehrli would easily win the trophy. Watch and listen to last Tuesday’s city council meeting when Wehrli interrupts public forum speaker and resident Shannon Robb, when she attempts to respectfully begin her three-minute presentation regarding a downtown sound system. Wehrli was more focused on protocol and procedure than to listening to what a resident had to say. He even tried to put her on the spot by ‘demanding’, ‘who told you, you could do this?” Fortunately the council over-ruled Wehrli’s outburst, and allowed her to continue. The good news is that Wehrli will no longer be able to say to another public forum presenter, “we’ve never done this procedurally’, because common sense prevailed and the resident was heard. Councilman Hinterlong, thought he had heard enough after just a few speakers, and the others didn’t need to be heard, even though 11 speakers took the time to come to the meeting in order to get their three minutes of speaking time. That might be considered disrespectful towards residents at the least, and most likely snobbish to most watching and listening. So if councilman Grant Wehrli is the ‘poster boy’ for snobbiest, who would be the ‘poster girl’? That would have to be Naperville council woman Judy Brodhead since she is the only non-male on the council, and because she clearly qualifies as helping ‘the snooty rule the city’. Watch and listen to Brodhead, as she discounts the speaker’s source (a blog) regarding the topic of ‘puppy mills’, again during the public forum portion of the meeting. So let me get this straight, information is worthless, unless it’s sourced from the city website, or the ’10th council member (local newspaper). We can only imagine that councilwoman Brodhead still tries to get her pictures developed at Woolworth, rents films from Blockbuster, looks for coupons for Ben Franklin stores, waits for the ‘yellow pages’ to be delivered, and uses a rotary phone. It seems like whenever Naperville city officials get themselves into trouble with awful decision-making, they reach out to the residents and businesses in Naperville to bail them out of the dilemma. The problem is they don’t learn from their mistakes, and in fact, compound them by making it worse. City officials find it much easier and more expedient to simply extract more money from anybody within city limits. The most recent issue, is one of water rates and utilization. The Naperville city council made huge mistakes and miscalculations regarding the Naperville-owned electric utility, and found themselves $25 milllion dollars in the red. So the council decided to borrow millions from the water utility to pay the electric utility. Brilliant on their part; rob Peter to pay Paul. Until they realized, that the water department (Paul) is heading towards the financial cliff. Now it appears the council’s game plan is a one-step process. Squeeze it out of Naperville residents and businesses, by jacking up the water rates, just as city officials are doing with the electric rates, Jim Holzapfel, Naperville’s water utility director, said in essence, that if income from water use narrows to a dribble, and “we start to look like we’re going to go negative, we can take some actions”, to stop it from becoming another huge financial deficit. Hence, the one-step solution; extract money from everybody within city limits. A number of years ago, during an extended drought, city officials implored residents to limit their use of water, and warned residents, that if they didn’t do it, water rates would have to be raised. Residents abided, either out of civic responsibility, or fear of rate increase. At the end of that summer, Naperville city officials announced that because of ‘less than normal’ water usage, in order to offset lost income by the water utility, city officials would have to raise water rates. There are still a number of residents around that remember that stunt, so it might be more difficult to pull that one off again, but looking at the bag of tricks the council uses, it’s pretty much a one-trick (raise rates) bag. Past experience shows that they are not very creative in solving issues. So the next time you’re squeezing your water hose nozzle, remember who will be squeezing you. When you watch and listen to a Naperville city council meeting, most of what you hear is rather boring to most people, I imagine few people watch online or on television, and even fewer attend council meetings. Every now and then you’ll hear something interesting or even somewhat controversial, but those are few and far between. One thing you don’t hear much, is a simple ‘Thank you” from city council members to city staff members when they are called upon by the council to add specific content or ‘expertise’ to an agenda item. It doesn’t seem like it would be very difficult to do, but it doesn’t happen often. Yes, I know it’s part of a city staff member’s job to provide information when needed, but it also seems like it would be a common courtesy by council members to occasionally say ‘thank you’. There was a book written half-a-lifetime ago (1986) titled, “All I Really Need To Know, I Learned In Kindergarten”, by Robert Fulghum. I’m pretty sure that somewhere in that book it dealt with showing appreciation with a simple ‘Thank you’. It’s possible that councilmen Grant Wehrli and Doug Krause are not familiar with the book, since they both tend to shy away from ‘Thank you’s’ towards city staff like vampires from sunshine. I imagine Krause waking up in the morning angry, and get more angry as the day unfolds, until it’s time for the council meeting, and he can then ‘let loose’ on city staff for any reason. Wehrli on the other hand comes across as city staff not being worthy of his presence. Directors, Managers, and Team Leaders deserve better. Considering recent revelations and allegations about city hall (The Municipal Center) being an alleged ‘hostile work place’, one would think that more appreciation would be expressed by city officials to hourly employees, including part-time who don’t get benefits as do council members. Let’s not forget Mike Bevis, the Chief Procurement Officer who always seems to be prepared for whatever is thrown at him during council meetings. I’m not sure I’ve ever heard any council member, during a council meeting say ‘thank you’ to him. I’m not even 100% sure what a ‘procurement officer’ does; I’m guessing he ‘get’s things’ that the city needs. He must to be doing a fine job because the City of Naperville has lots of nice things. Some Naperville city council members do a good job of being respectful and appreciative to city staff, including councilmen Chirico, Hinterlong, and McElroy. And nobody does it better than Mayor Pradel. Maybe some council members think ‘thank you’s’ are not necessary since at the beginning of each council meeting there is an ‘Awards and Recognition’ portion, where individuals and departments are spotlighted for doing a great job. The only problem with that is, a good number of council members are not investing their full attention to the recognition; those little hand-held devices are addictive, aren’t they. And who’s idea was it to recognize the IT Department for doing an outstanding job immediately after the city’s website was hacked and down for more than a month. So how about council members show city staff more appreciation, give their full attention during ‘recognition’, and say ‘thank you’ at the appropriate time. That seems reasonable, doesn’t it. Maybe it’s just me, but did anybody find it unusual that the City of Naperville’s lead attorney (Margo Ely), who also functioned as the Human Resource director, left town quickly, and I mean quickly. Her departure was announced during the Naperville city council meeting on April Fool’s Day. Naperville’s Mayor Pradel, made it abundantly clear that “she will not be here for the meeting on April 15th”, two weeks later. That left no wiggle room for a change of heart on her part. Reports had it, that when she turned out the lights in her office, she was out the door and in her car before the room was dark. The strange part is that within a month of her departure, allegations surfaced about bullying, drug use, and other inappropriate behavior on the part of Human Resource Department ‘leaders’. At least one complaint was filed by an eight-year Human Resource Department employee. It’s possible that everything in the HR department began to fall apart the moment Ely left. I mean it is possible, right? It’s also possible the Cubs could win the World Series this year, right? Lots of things can and do happen in the inky shadows of city hall. This story won’t be going away soon. Now that Ely is gone, she has conveniently distanced herself from the ‘cauldron of boiling tar’ within the city. That leaves Naperville city manager, Doug Krieger, to take the heat, which is great for the Naperville city council. As long as Krieger is bumbling and stumbling, the council is separated by one-degree from the allegations, any wrong-doing, and ineffective leadership. In essence, Krieger is an insurance policy for city council members. They can blame ‘it’ on Krieger,’ it’ being everything that goes wrong. The council wouldn’t be incorrect, since Naperville City Manager has had an unending series of major mis-steps. As long as the city council is unwilling to ‘take action’ by launching Krieger, they become part of the problem, rather than part of the solution. There are a number of things we can all agree upon, including children-focused charities are a really good cause. We most likely can all agree that Mayor George Pradel has had a good 20-year run as Mayor of Naperville and he deserves whatever good comes his way. And most of us can likely agree that golf is fun; well maybe not that one. I am one of the few that consider golf as a good walk spoiled. The ‘Naperville Mayor’s Golf Outing has been a yearly event for 34 years. That’s even longer than councilman Doug Krause has been on the council, but not by much, and when the event started, councilman Grant Wehrli was running around the school yard telling other kids what to do, where to do it, and how to do it. This year, one of the event’s helpers (Allison Segebarth), who is non-paid and without part-time benefits (the same can’t be said about council members) asked the Naperville city council (minus Pradel and Brodhead who weren’t there) to allow the charitable event to use the city logo on shirts handed out as a ‘thank you’ for those attending and supporting Naperville based children’s charities. Watch and listen to councilmen Doug Krause and Grant Wehrli who didn’t waste any time ‘sucker-punching a hole’ in the request. Krause seeing it as ‘dangerous’, and Wehrli is fearful that it will open ‘Pandora’s Box’. Chances are that even ‘Pandora’ would have supported such a worthy cause, just as Naperville councilmen Fieseler, McElroy, and Wentz were, when they were the only three to vote in favor of the reasonable request. Watch and listen as councilmen McElroy and Wentz show compassion and appreciation in their tone of voice towards the speaker. Both Krause and Wehrli could have been a bit less cold-hearted and hard-nosed towards the speaker, and more tactful in their ‘pound-down’. The definition of ‘tactful’ is ‘telling someone to go to hell, and make them happy they are going’. In addition to Krause and Wehrli, those voting against the request included councilmen Chirico and Hinterlong. My guess is that the City of Lisle or Wheaton would be honored to allow the event to use their city’s logo to support the ‘Naperville Mayor’s’ children’s charity golf event as a parting ‘Thank you’ to Mayor Pradel for his 20 years of service to the community. Let’s keep it simple and use Joe’s brilliant idea, just tweak the logo, and everybody will be happy.